Their war for freedom in Libya may be over, but almost a year after they won the battle for the Libyan capital, a group of fighters have a new battlefield: Syria. Under the command of one of Libya’s most well known rebel commanders, Al-Mahdi al-Harati, more than 30 Libyan fighters have made their way into Syria to support the Free Syrian Army rebels in their war against President Bashar al-Assad’s regime. Al-Harati, who commanded the Tripoli Revolutionary brigade — which was the first group of rebels to enter the Libyan capital last August — has been in Syria for months leading some of his former men and Syrian military defectors who have joined his “Liwaa al-Umma” or “The Banner of the Nation” brigade. Al-Harati, who has dual Libyan and Irish citizenship, first visited Syria last year on what he calls a “fact finding mission” to see the situation on the ground and find out what Syrian rebels needed. “After many Syrians approached me asking for my help, I felt it was time to do more and due to the great success of the Tripoli Brigade we felt it was time to act and that meant the formation of the Banner of the Nation,” Al-Harati told CNN in Skype messages this week. In the past week, at least three more former members of the Tripoli Revolutionary Brigade traveled from the Libyan capital to join their former commander in Syria, two former members of the TRB says. Al-Harati, who describes himself as a “commander and facilitator” says there were no active efforts to recruit Libyans. “These are grown men with their own minds and do not need convincing about this cause,” Al-Harati said. Mohammed, 23, fought in some of the fiercest battles against Moammar Gadhafi’s troops in Libya’s Western Mountains. One year on, he dreams of fighting al-Assad’s troops. He does not want his last name disclosed because he does not want his family to know he wants to go to Syria. “What Bashar al-Assad is doing is unacceptable in Islam … He is killing children and wiping out entire cities … The Syrians need people to fight with them, this is Jihad, it does not have to be my (personal) cause … As a Muslim I have to go and help them,” he said. Mohammed smiles as he recalls the fighting in Libya last year, like now he says, it was during the Holy Month of Ramadan. “There is nothing better than Jihad during Ramadan … There are some people who look at us and say we are Jihadist extremists, we are not. In Libya we experienced Jihad, tasted the beauty of Jihad. We are not going to Jihad like al-Qaeda and others. We are going to support our brothers in Syria,” he said. Another fighter is Housam Najjair. He is 33, al-Harati’s brother-in-law, and had never used a weapon until he fought in Libya last year. He said: “When I watch TV reports … you hear the cries of an old woman or a mother of a child who has been killed, or some of the brutal pictures that we have seen of children being killed … I can not sit back and watch that,” Najjair told CNN in a Skype interview from one of Turkey’s borders with Syria hours before making the dangerous journey into Syria. “I have to do whatever I can to make that journey. Because I feel guilty putting my head down at nighttime knowing that last year I was given an amazing opportunity to learn how to use weapons, for good, all for good, learn how to use weapons, how to maneuver, how to travel, how to attack, how to defend, all these things,” Najjair said, adding that his aim is to share these experiences with Syrian rebels. During the interview, Najjair got the phone call he had been waiting for, his group of fighters is mobilizing to go into Syria. “It is a rollercoaster of different kinds of emotions, you get excited, you get adrenalin, fear, anticipation, all these feelings come into it, fear is not the main factor and in my mind will never be … it will impair your judgment … Libya was a walk in the park compared to Syria, I know this going in there,” Najjair said as he prepared to leave. Najjair says the no-fly zone enforced in Libya last year helped rebel fighters and allowed them to make great advances. Without that in Syria, operating will be much harder. He says they do not have a military base, there are makeshift barracks; they are constantly on the move and cannot spend more than a day in one location. Fighters, he says, are scattered across different areas. Last month, a senior Libyan security official told CNN the government was aware of Libyans fighting in Syria, but they were individuals and not government sponsored. Earlier this year, Russia’s ambassador to the United Nations, accused Libya of hosting and training Syrian rebels. A claim denied by the Libyan prime minister. But Libya’s government and people have been vocal in their support for the Syrian opposition. Libya was one of the first countries to recognize the opposition Syrian National Council as the legitimate representatives of the Syrian people and in February, Tripoli expelled Assad’s diplomats and closed down their embassy. Many in Libya say they relate to Syrians who want to overthrow the regime. It was not too long ago that they lived a similar experience. But not everyone chooses to express support militarily. Some show solidarity by hanging the Syrian opposition flag outside their shops in Tripoli, flying alongside the Free Libya flag. In a YouTube video posted on July 4, a group of six Libyan doctors is seen being greeted by Free Syrian Army troops as they enter Syria. “We are coming for you Bashar,” says one of the doctors as they shake hands with the heavily armed Syrian fighters. There are no official figures on how many Libyans are currently in Syria. In February, reports of at least four Libyan fighters killed in Syria circulated, but there has been no government confirmation. For fighters like Najjair, the risk of death is a matter of faith. One can hope it’s not al-Harati’s Waterloo … but people DO go on their convictions, and have done so many times in history. Sounds like Libyans are beginning to see what is right for humanity. Name it ‘Jihad’ or whatever you wish … it’s a concept of good VS evil that raises hope, as good invariably must win if mankind is to ever survive. Sadly, they’ve shown him with WAY too much chin! Have you got a thing for chins. 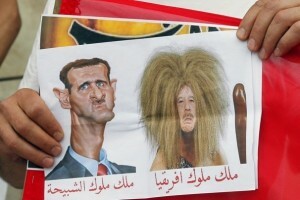 Every time they show Basher Assad picture you mention his chin. Get over it you idiot. It isn’t just HIM … they’re the ‘chinless-twins’, him and his LOWLIFE brother! What a joke, freedom in Libya. The country is in turmoil after the west invaded for absolute nothing. Hey you mercenaries, Syria isn’t Libya. You will see you demise there no doubt.